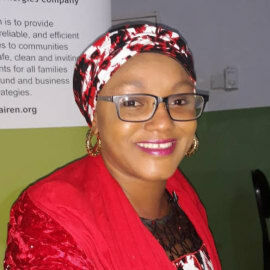 Habiba Ali is the CEO and Managing Director of SOSAI Renewable Energies Company Nigeria. SOSAI Renewable energies offers reliable and sustainable products such as solar lamps, solar home systems and water filters to the people of mostly the rural and peri urban communities of Northern Nigeria. Currently, SOSAI Renewable Energies focus on empowering communities and businesses with solar technologies.